The Strobel Company of Cincinnati, Ohio was founded in 1849 and first manufactured leather goods. In 1864 George Wilken joined the Strobel company business which then became known as STROBEL & WILKEN, they also then began to distribute toys and many other fancy goods. 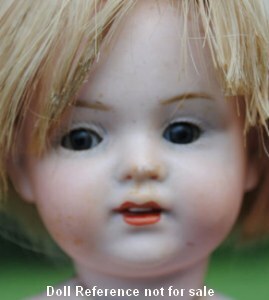 After the Civil War when trade was resumed with Europe, they distributed and imported, mostly German made bisque head dolls. In 1886 a branch office was established in New York City, which soon became Strobel & Wilken's main office. 1909+ Character Doll, Kämmer & Reinhardt Baby doll, or Kaiser Baby, 11-20" tall, bisque socket head, composition jointed bent limb baby body, molded painted hair, painted eyes, open/closed mouth. 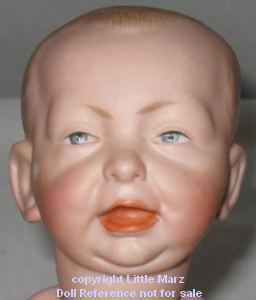 The 100 doll mold, Kaiser Baby dolls also came with glass eyes and were also distributed in the United States by George Borgfeldt. 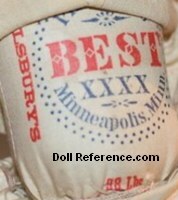 All Bisque Girl doll 4 1/2"
Strobel & Wilken, 7" tall, bisque head doll with fabric Pillsbury Best XXXX, Minneapolis, Minn. Flour. 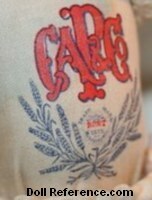 with a wheat sheath symbol beneath. W & S or S & W.
1895-1924 American Beauty cloth rag dolls. 1897 used a mark of S W & Co. Karlsbad on pottery, possibly from the factory of Bawo & Dotter in Karlsbad Germany. 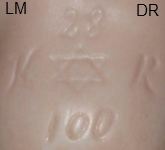 1903 registered the name Royal doll, for Kämmer & Reinhardt's line, sold Alfred Heller's metal head Diana dolls. 1906 advertised American Beauty rag dolls with photographic colored faces named; Darling dolls, Wonderland dolls, American Fashion dolls dressed. 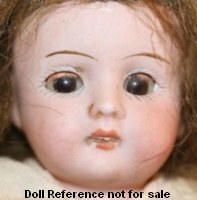 1908 sold Kämmer & Reinhardt's Royal doll line including The Flirt Doll, whose sleep eyes also moved side to side. 1909 advertised K & R Royal doll line; K & R mold 100 Kaiser Baby doll, Handwerck dolls, Hertel, Schwab & Co bisque doll heads in the Jubilee doll line, Character dolls; Commander Robert E. Peary doll, Dr. Frederick A. Cook doll, North Pole expedition dolls. 1909 Kämpfe & Heubach cloth body and cloth or celluloid face Alice doll. 1911 distributed dolls for Ideal Doll & Toys and Kämpfe & Heubach, also known as the Wallendorf Porzellanfabrik. 1913 advertised Aluminia doll metal heads, distributed cloth Käthe Kruse dolls. 1914 registered Brighto doll, Arabesque doll, Our Pride Kidette doll, all bisque Peach doll mold 257 and Nemo doll. 1914-1915 advertised American Beauty dolls with kid body, bisque heads by Edmund U. Steiner with mark of E.U.St. 1915 advertised cloth character dolls Susie's Sister doll, Tootsie doll, Character Baby dolls Käthe Kruse look a like dolls made in the USA by American Art Dolls controlled by Strobel & Wilken. 1916 distributed Zaiden dolls, Utlely's Rollinson dolls and American Art cloth dolls; Ulrich doll, Buddy doll and Faith doll. 1918 distributed American Toy & Mfg Company Snow White dolls. ca. 1920s or 1930s sold composition shoulder head, Mama dolls, marked on neck STROBEL WILKEN Co.
1926-1930 distributed W. Bimblick & Co wood segmented dolls, line of Joy Doll Family dolls. 1930 advertised their line of American Beauty cloth rag dolls.